The .45 ACP cartridge was developed as the result of extensive tests of the terminal effectiveness of various rounds, conducted in 1904 by Col. Thompson and Maj. La Garde on behalf of the US Army. After these trials, the commission recommended the replacement of the existing .38 caliber revolver cartridge with a cartridge that fired a bullet of 0.45 inch caliber (11.43mm). The original recommendations were for a bullet of 200 grains (12.96 gram), but this was later changed to a 230 grain jacketed ‘ball’ bullet. 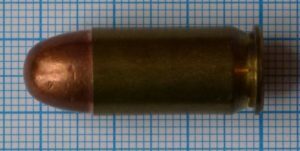 The case was produced by cutting down the .30-03 rifle cartridge case to a length just below one inch. In 1911, this cartridge was officially adopted by the US military as the “Cartridge, .45 caliber Ball, M1911”, along with the famous Colt M1911 pistol. Since its introduction this cartridge has been used in many semi-automatic pistols, as well as in a few revolvers (using half-moon or full-moon clips) and in several sub-machine guns, starting with the famous Thompson. This cartridge was never popular in Europe, and found favour only in Norway, with their M/1912 and M/1914 pistols, which were licensed Colt designs. On the other hand, this cartridge was and still is extremely popular in the USA, as well as in South and Central America. For many years this round was standard military issue in countries like Argentina and Brazil. Despite the fact that the US Army replaced the .45 ACP as its standard issue pistol ammunition with 9mm in 1985, this cartridge still fares quite well, thanks to its large bullet, which causes significantly greater terminal effects even in military ‘ball’ configuration. What is even more interesting is that the US Army as of January 2017 again changed its service pistol to a modular system (SIG P320, redesignated as M17 or M18) with the option to chamber it for .45 ACP. The .45 ACP, also known as the .45 Automatic, has a rimless, straight case, usually made of brass, although it also may be encountered with aluminum (US-made) or lacquered steel (Russia-made) cases. The standard military bullet is of jacketed type, weighing 230 grains (14.9 gram). Self-defence and police ammunition can be loaded with a great variety of bullets, including frangible, expanding and other types of bullets. Most common police or defensive loadings use jacketed hollowpoint bullets of various makes, weighted from 185 to 230 grains (11.99 to 14.9 gram).